Sources 1 & 2On November 15, the FCC approved a revision to the plan for Starlink, SpaceX's forthcoming broadband satellite service. The new plan reduces the number of satellites from 4,525 to 4,409 and lowers the altitude of the phase-1 satellites from 1,100 to 550 km. Mark Handley, a professor at University College London, has created videos based on simulations he ran of both the original and revised phase 1 plans. You should watch the videos, but it will help to first look over a few images from his simulation of the new plan. 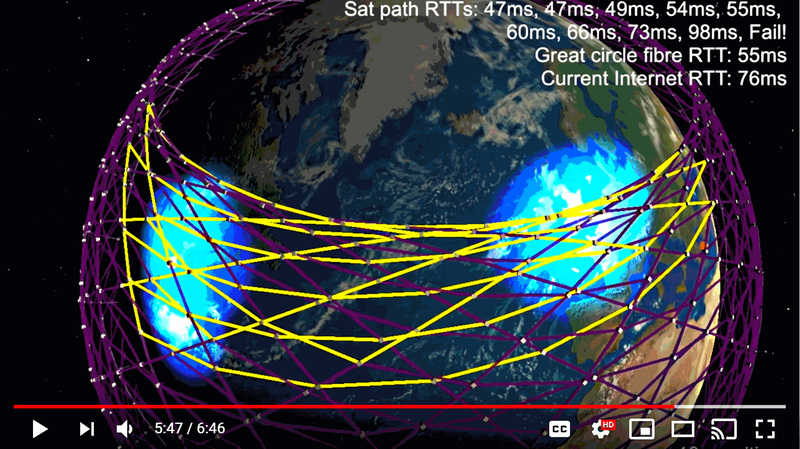 Starlink phase-1 is shown below. Handley assumed a phase offset between adjacent planes that would minimize the chance of a collision. 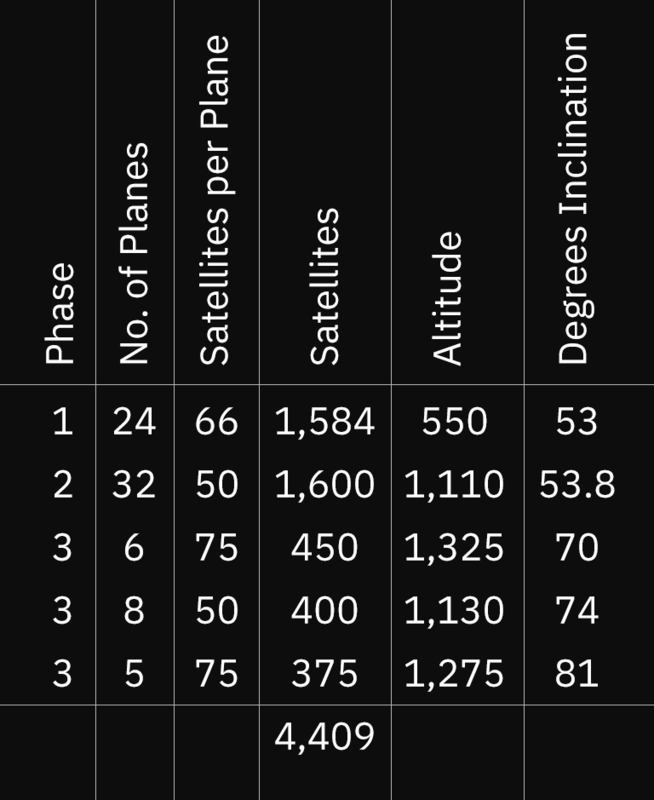 The minimum crossing distance between satellites is a little over 90 km — an improvement over the previous plan. Radio transmission will be used for links between the satellite constellation and the ground and laser links will be used between satellites. 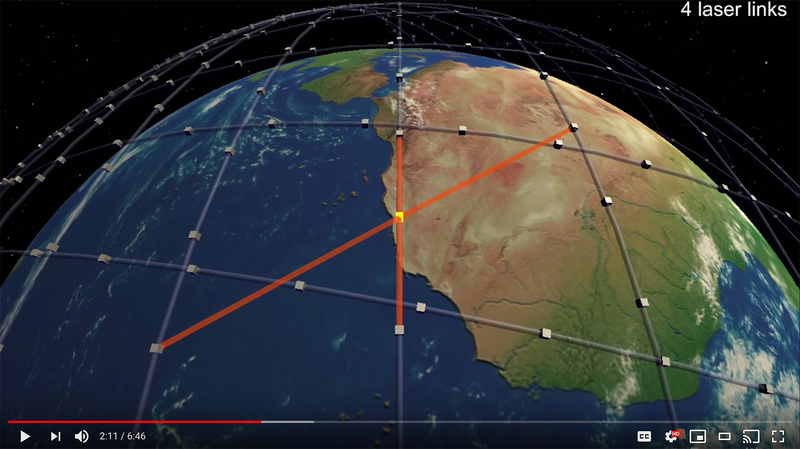 Handley assumed that each satellite links to the one before and after it in its plane and to the second closest in the adjacent planes in order to improve east-west routes. In his simulation of the first plan, he assumed a fifth laser linked to a satellite in the crossing plane, but that would be more difficult at this fast-moving lower altitude. It will be interesting to see how SpaceX uses the inter-satellite links. 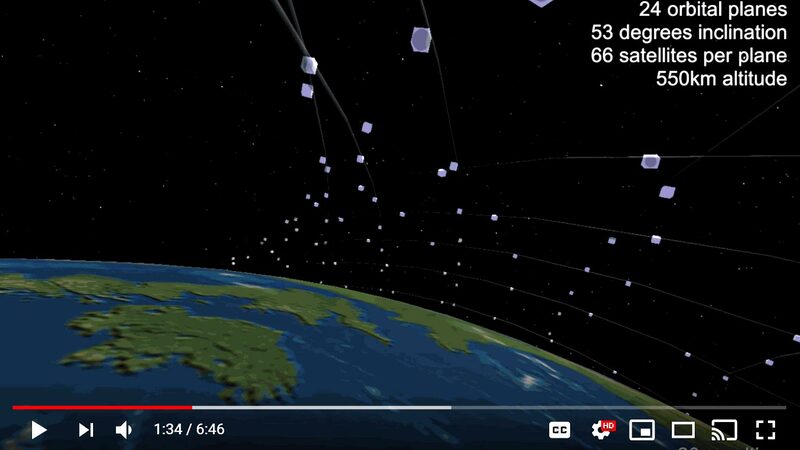 Each satellite is linked to four others, forming a mesh network. A simulated route between San Francisco and London is shown below. Note that latency is about half that of current, terrestrial routes. (The latency advantage of satellite routes over terrestrial is generally greater for long distances). Nine parallel routes between New York and London are shown below — eight have lower latency than the current, terrestrial route. The following image shows all three phases — Handley is not sure if the other two will interact with the phase 1 satellites. 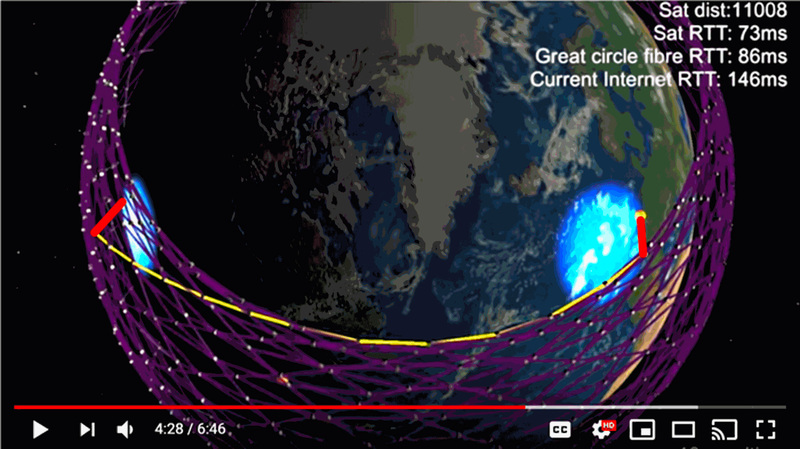 Only Elon Musk knows what motivated this revision in SpaceX's Starlink plan, but we can speculate. They have had two test satellites in orbit at around 550 km altitude for some time, and that experience must have informed the decision. Musk reported that the links between the test satellites and the ground were performing well, but did not mention the laser links between satellites. Perhaps they feared difficulty with the longer laser links at 1,100 km or some other engineering problem. (Musk recently fired several managers in an effort to keep the project on schedule). 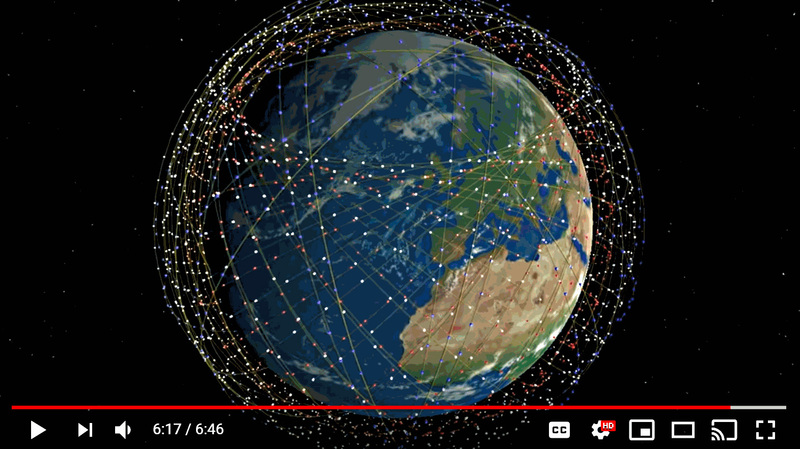 Because SpaceX and others are planning to launch thousands of new low-Earth orbit satellites, the FCC is focusing their attention on debris mitigation. The chance of a collision with the new plan is reduced since the minimum distance between satellites increases from over 40 to slightly over 90 km and. The lower-altitude satellites may require more fuel to overcome a slight increase in atmospheric drag, but they will be easier to de-orbit when their life (around 5 years) is up, further reducing the likelihood of a collision. Starlink's primary goal is affordable global broadband service to individuals and organizations, but Musk has also predicted that they would carry half of the global long-distance traffic. Handley's simulations predict roughly 2X latency improvement over current terrestrial cables on long routes and he points out that low-latency long-distance service will appeal to financial companies with offices in Europe, North America, and Asia. If capacity turns out to be sufficient, I imagine Starlink will also attract tier 1 ISPs and large companies like Google. 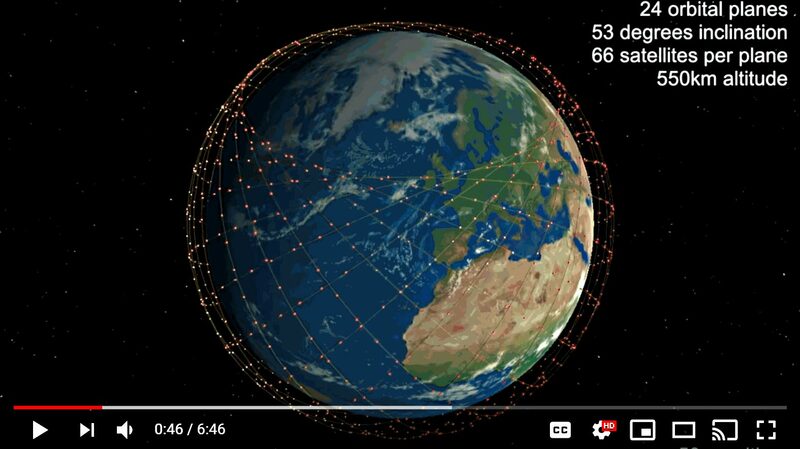 Finally, SpaceX also has approval for a constellation of 7,518 very low-Earth orbit satellites operating at altitudes from 335km to 346km. These will not be launched until SpaceX has satellite engineering, regulatory and market experience and time to assess potential cooperation/competition from 5G terrestrial networks. I recommend watching the videos of both of Handley's simulations because the narratives are different and both are inciteful. You should also read his paper Delay is Not an Option: Low Latency Routing in Space. Local Time: Wednesday, April 24, 2019 01:15 PM PDT – Page Load: 0.2910 Sec.